Highlights By Haley was provided with compensation for this post. Regardless, I only recommend products or services I use personally and believe will be good for my readers. Cows and Sheep and Chickens On My! Get ready for a whole new world down on the farm! With the all-new My Town™: Farm kids visit the farmer's house, harvest the fields and gather the eggs hens have laid for a fresh breakfast! There is even a beehive where you can learn how bees are born. 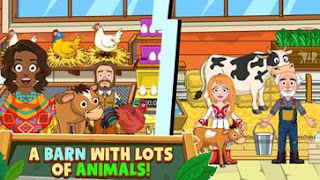 The newest title in the best-selling My Town Games series, My Town: Farm is available now from the App Store and Google Play for $2.99. 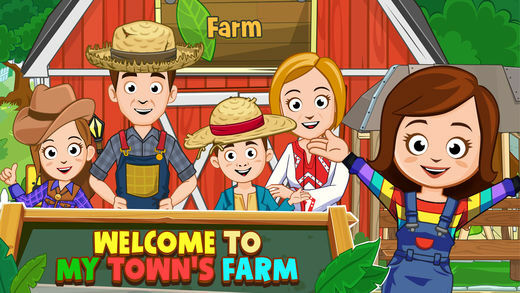 The six different locations in My Town: Farm offer all you need to create brand new stories for your favorite My Town characters, and even add some new friends! When you need supplies or perhaps want to show off your crops, you can head over to our super special farmer’s market. Whatever location you choose to explore, there are hours of fun ahead! An added bonus is connectivity of My Town games and with shared characters and places that can travel from one game to another --all part of the larger My Town family of apps. Pay once & Play forever + receive FREE updates! No ads and no IAP. This was Aydin's first My Town app. He loves Farm Animals well I would just say animals in general. So he was really tickle and had a lot of fun trying this new app out and getting to see all the different farm animals that are in the game. He loved feeding the many farm animals he had. I enjoy watching him play this new app that he enjoyed so much and the fact that he said he could have all the animals he wanted to have on here and he was big enough to take care of all of his pets his self on here. I fully agreed and was happy to tell him he was right cause their no way I could raise half the animals on their he had in the real world. New Characters – If you have My Town: Home (FREE to download! ), My Town: Pets, My Town : Museum or My Town : Haunted House, you can bring your characters from that game over to My Town: Farm to join the fun! The farmer just might want to find a new pet in My Town: Pets to visit the farm! 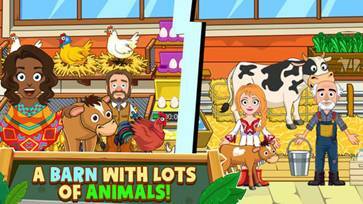 A BRAND new “Mix ‘n’ Match Machine” that creates NEW items from the farm’s products that you have collected. If you can imagine it, you can make it. Everything is possible in My Town: Farm! Created by an expert team of designers, engineers, programmers and artists, loved by kids and parents alike and endorsed by teachers and therapists, My Town Games is a safe, digital platform that gives children hours of open-ended play to teach them to interact first with an imaginary world, which can then empower and embolden them to explore their physical world and learn how things work. In the My Town Games world – 104 locations, 50 characters and 5300+ objects and counting – kids ages 4-8 play and interact with a variety of things in places and with people they see, recognize and know in their real, everyday lives – their homes, communities, family, friends and neighbors. 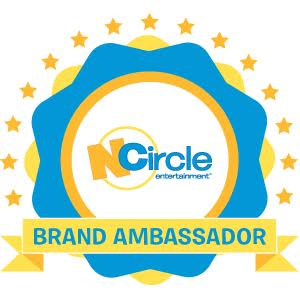 There are over 20 titles in the series including Pets, Haunted House, Museum, Fire Station, Cars, Beauty Contest, Cinema, Grandparents, Preschool, Hotel, Spa Beauty Salon, Dance School, Fashion Show, Wedding, Police Station, School, Stores, Daycare, Beach & Picnic, Hospital and Home. With no rules, no time limits and no restrictions on how to progress through the games – which are so user-friendly natural that no prompts or instructions are needed - children are free to explore the worlds all on their own . The My Town Games studio designs digital dollhouse-like games that promote creativity and imaginative interactive play for young children all over the world. Since launching they have built games that have been downloaded 13 million times in 200+ countries. 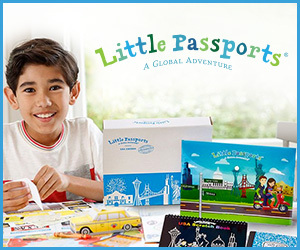 Loved by children and parents alike, the games introduce environments and experiences for hours of open-ended game play. The company has offices in Israel, Spain, Romania and the Philippines. Visit My Town here.